In a semi-final matchup of the Progressive Legends Classic versus Penn State, the Pitt men’s basketball team was annihilated by its in-state foe, falling 85-54 in a game that was essentially over by halftime. The Panthers (1-3 overall, 0-0 ACC) had nothing going for them in a blowout loss to the Nittany Lions (4-0 overall, 0-0 Big Ten), falling behind early and failing to recover. Pitt could have used some of the shooting touch of two-time NBA MVP Stephen Curry — who was watching from the Barclays Center sidelines — as the team shot an abysmal 31 percent from the field. After allowing two early 3-pointers, the Panthers first got on the scoreboard when junior guard/forward Jared Wilson-Frame countered with a three of his own. But Penn State quickly went on a 10-0 run and established an early 16-3 lead, prompting a Pitt time-out. Senior point guard Shep Garner led the Nittany Lions’ early attack with six points in the first five minutes. The Panthers continued to fall behind, chucking up 3-pointers instead of working the ball inside. Pitt went the first 10 minutes without making a 2-point field goal — first-year guard Marcus Carr scored the team’s first non-three with 9:31 remaining in the first half, making the score 27-11 Penn State. Pitt’s inexperienced roster — which entered the season with an NCAA-low three starts combined — struggled against Penn State’s more experienced roster. Pitt went ice cold from the field, making just 28.6 percent of its first-half shots. On defense, the Panthers allowed their opponent to make 17 of 33 field goals, including six 3-pointers. The Nittany Lions went on a 15-1 run to end the half, giving them a 47-21 lead and deeming the game a foregone conclusion after just one frame. Sophomore guard Tony Carr led Penn State’s offensive eruption, scoring 14 points and sinking all four of his 3-pointers. Wilson-Frame led all Panthers with eight points, while no other player managed more than three points. Down 26 points, and with a win nearly out of the question, the Panthers entered the second half looking to preserve their dignity and prevent the deficit from growing any larger. 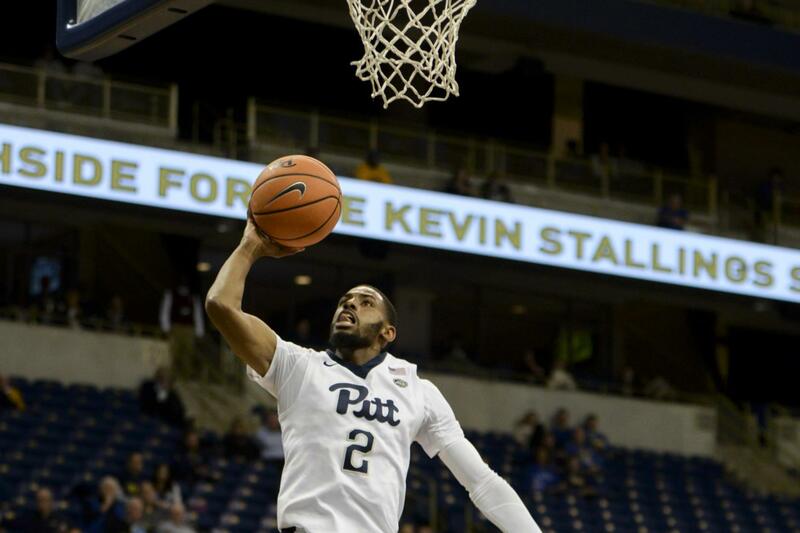 Senior guard Jonathan Milligan kept Pitt afloat with five quick points to start the half, but the Panthers failed to get stops on defense and fell behind even more. Penn State led by 34 points, 63-29, with 11 minutes remaining in the game. After a jumper by Wilson-Frame, the Panthers went on a nine-minute scoring drought in which they went zero for 12 from the field. Senior forward Ryan Luther finally ended the dry spell when he hit a free throw with eight minutes remaining, making the score 69-30. For the remainder of the game, head coach Kevin Stallings took the opportunity to give floor time to some of Pitt’s less-experienced players, including first-year Nigerian prospects forward Samson George and center Peace Ilegomah. Ilegomah went 2-2 from the free throw line and also contributed four rebounds. By the time the final buzzer sounded, six Penn State players had tallied double-digit points, led by Carr’s 16 points. Wilson-Frame was the only Panther to score double digits, leading the way with 17 points, while Pitt’s Carr was second with nine. Luther, normally a leader on the Panthers’ young roster, produced an uncharacteristically poor performance in which he made two of 11 shots. The Panthers remain in Brooklyn to take on Oklahoma State in the tournament’s third-place game with the tipoff set for 3:30 p.m.